One of the favourite hangouts for my kids and family in Seattle is Woodland Park Zoo. We plan a full day to spend there whenever we visit and every moment of it is experienced to the fullest by my family members exploring animals and birds in the zoo. After visiting couple of times in a row and kids requesting for more visits, I started searching for discount coupons (Don’t ask my why I’m not buying membership, that’s a story for another day!). Google shows a lot of links with discount coupons/codes for Woodland Park Zoo but most of them did not work. The links popped up on Google search results are either dead deals or search engine optimized pages with ads littered everywhere. After multiple unsuccessful attempts to find discount coupons online, I finally found upto $8 off discount coupons at SeaTac International Airport baggage claim area. The baggage claim areas has several displays with a lot of flyers for providing information to visitors. One among those flyers is Woodland Zoo’s and each flyer gives 2$ off admissions for up to four people. So a single flyer can get a discount of 8$ when 4 members of a family visits the Zoo few weeks ago. This works out to be around 10% off of adult admission tickets and a bit more of children tickets. That’s a good deal! 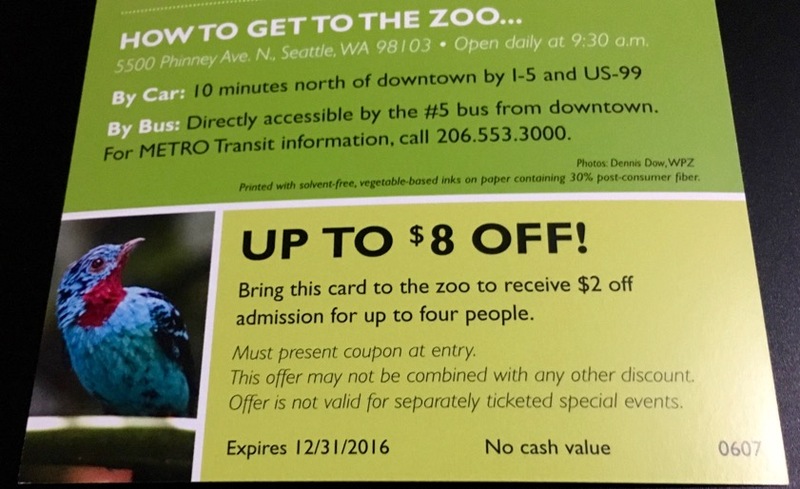 So next time when you are around SeaTac International Airport grab couple flyers to save money on your next trip to Woodland Park Zoo.